With the recent daylight saving time shift and our family's personal loss, I have been finding some simple ways to incorporate a bit of hygge into our home and our days. It has been so needed! We all appreciate a soft place to rest our heads-- and our homes are a wonderful place to start. The fall and winter months are natural times to turn inward and slow down a bit. Here are five accessible ways to bring a little hygge into your days. Wear cozy socks with a bit of padding when you are home. I briefly considered trying out some UGG socks but reconsidered when I found socks on Amazon here. They are wonderful and much cheaper. I have a few different pairs that I slip on when I am home. Instantly, I feel nurtured. Slippers may do this for you too. Amidst the memorial these past few weeks, we had family in town. Naturally, we had meals and conversations at our home. A time of gathering. Amidst the full schedule, it brought me such pleasure to wear something comforting as I was hosting and connecting. 2. Take baths to relax and wind down. John and I share this ritual most nights. The cold can get to my bones at times and I have difficulty heating up. Baths provide an immersive experience that warms me to the core. Try Epsom salts to enhance your sense of relaxation! As it turns out, a nighttime bath ritual is also associated with better sleep! If I am feeling chilled during the day, I often sit by our fire or warm up my heating pad. I love to sit and write with a bit of warmth on my lap. My heating pad is not electric but heats up in the microwave. You can find a similar one here. Larger is better for me. And I have been known to take my heating pad in the car with me! Or I may place it in my bed for a bit before I head to sleep. So many options! 3. Wear clothes that are flattering but also soft and warm. My capsule wardrobe for fall and winter consists of four bottoms and ten tops that are interchangeable. All are warm and comfortable to wear. I love the ease with which I am able to get ready each day--and how it feels to have clothing that is both functional and cozy! 4. Incorporate candles (or other sources of calming light) and hot drinks into your day. I begin each day by turning on sparkle lights, lighting a candle, and savoring my morning cup of coffee. I view this part of my morning routine as an accessible way to bring light and warmth to the start of my day. Incorporating a hot beverage of choice into the flow of the rest of my day is a delightful way to slow down and experience pleasure as I run errands, plan my week, or work. Candles are wonderful companions to my days at home as well. The scent and glow make my environment feel inviting and relaxing. 5. Gather for a meal with those you love. Add candlelight. I love warming up my meals in the fall and winter. I also am thrilled to have a more predictable rhythm for family dinner. 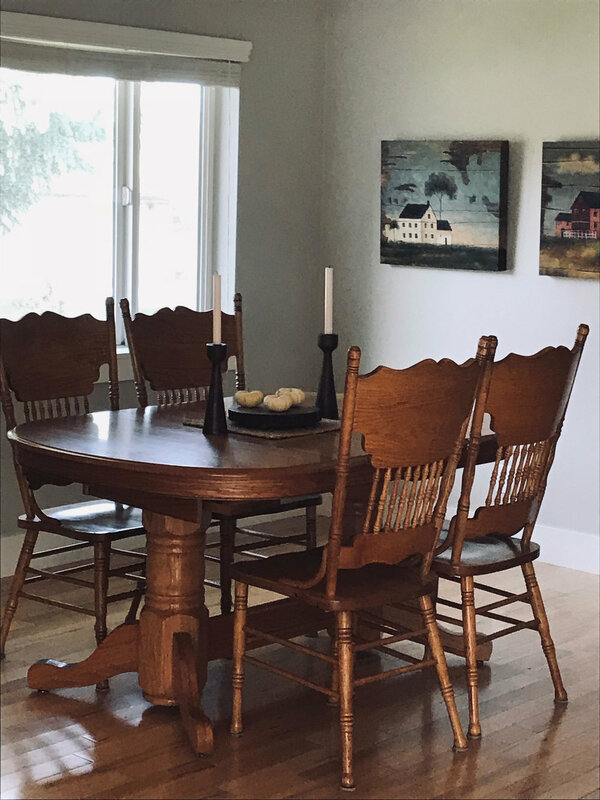 We light candles, gather around our old oak table, and enjoy a meal together at the close of day. The darkness of night is a fact this time of year-- but our home is filled with warmth, light, and togetherness. I hope that you are feeling a bit of comfort wherever you find yourself. Are you? What are the ways you feel cozy each day? I would love to hear what is working for you lately!